The Community Development and Knowledge Management for the Satoyama Initiative Programme (COMDEKS) was launched in 2011 to support local community activities that maintain and rebuild target production landscapes and seascapes, and to collect and disseminate knowledge and experiences from successful on-the-ground actions so that, if feasible, they can be adapted by other communities throughout the world to their specific conditions. The programme provides small-scale finance to local community organizations in developing countries to support sound biodiversity and ecosystem management as well as to develop or strengthen sustainable livelihood activities planned and executed by community members themselves. The target landscape for COMDEKS activities in Niger is the area surrounding “La Mare de Tabalak,” or Lake Tabalak, a natural freshwater lake located in the central southwestern part of the country. 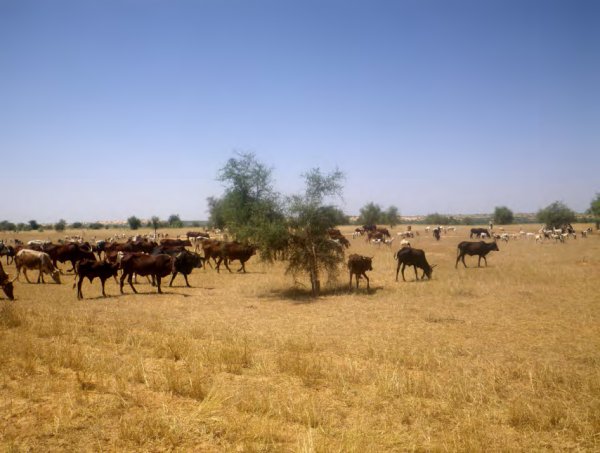 It is situated in the climatic transition zone between the Sahara in the north and the Sahel in the south, which also marks the transition zone between the agricultural and the pastoral areas of Niger. The target landscape for COMDEKS activities in Niger is the area surrounding “La Mare de Tabalak,” or Lake Tabalak, a natural freshwater lake located in the central southwestern part of the country. It is situated in the climatic transition zone between the Sahara in the north and the Sahel in the south, which also marks the transition zone between the agricultural and the pastoral areas of Niger. As part of the Ader-Doutchi-Maggia plateau, the watershed spreads across 3,557 ha within the Tahoua region and is situated 50 km east of the town of Tahoua. The average altitude of the basin is 395 m, with the highest point reaching 746 m.
Due to its geoclimatic position in the middle of an arid zone, Lake Tabalak is a humid area that plays an important role in maintaining the biological diversity in this region. It also substantially contributes to the socioeconomic activities of local communities, whose livelihoods depend on agriculture, livestock breeding and fishing. During the wet season (June-September), the lake fills with surface run-off from a vast watershed that covers about 142,000 ha across six different communes. By the end of the wet season, in September, the lake is a thread-shaped reservoir. Due to silting and evaporation, it is usually divided into three separate reservoirs at the end of the dry season in April or May. The surface area of the water body varies according to these seasons, from 50 ha to almost 1,000 ha with an average depth of 2 meters. In terms of topography, the basin is composed of a series of plateaus, inland valleys and sand dunes. The ecosystem surrounding Lake Tabalak is a remarkably verdant and beautiful wetland habitat surrounded by an arid landscape. It is one of twelve critical wetland systems in the region, and was registered on the RAMSAR list of Wetlands of International Importance in September 2005. 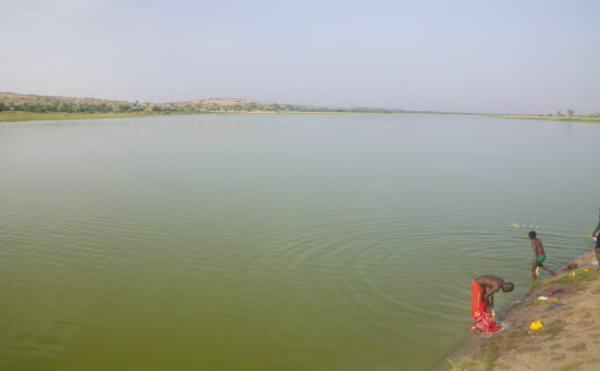 As a wetland in an otherwise arid environment, the area surrounding Lake Tabalak plays a critical role in maintaining biodiversity. It is home to many species of flora and fauna, most notably as a key habitat for hundreds of migratory birds of the Western Palearctic, such as waders, limicolines, and ducks. It is also an important transition area for the black crowned crane (Blearica pavonina), a species that is rare even in other parts of the country and which is now endangered largely due to habitat loss. The aquatic fauna is composed of crustaceans, batrachians (salamanders, frogs), and fish, including Clarias lasera, Lates nilotica and Tilapia niloticus. Mammals in this area mainly comprise small rodents such as rats, squirrels, hedgehogs, mice, and jerboas. The local flora mainly comprises grassy species such as Cenchrus bifloris, Aristida spp, Echinochloa spp, Solanum nigrum, Brachiaria spp, Typha australis, as well as exotic tree species including Acacia nilotica, Acacia raddiana, Bauhinia rufescens, Bauhinia reticulatum, Acacia albida, Balanites aegyptiaca, Eucalyptus camaldulensis, and Prosopis juliflora, among others. Deforestation to meet local energy needs, overgrazing by livestock, and land clearance for agriculture, combined with the incidence of drought, is leading to erosion, degradation of soil quality, and the loss of biodiversity in the region. The landscape is characterized by zones of plateaus, hollows, gentle slopes (glacis), and sand dunes. The plateaus are composed of lateritic soils, which are mainly used for grazing, forestry and exploitation of the lateritic soil itself due to its high content of clay, minerals and ores. Due to strong wind erosion, the sharp sand dunes in the landscape lack woody vegetation, but offer a variety of grassy species that are favored by livestock. The zone between the sand dunes and the valley is referred to as the glacis, on which a number of tree species are found. This zone has been experiencing uncontrolled exploitation of woody vegetation, mainly for firewood and saw logs for local communities. Finally, the zone of hollows comprises the lake, the area directly surrounding the lake, as well as the koris (river valleys, carrying runoff water to the lake). This is the main area used for irrigated farming, fishing and pasture in the target landscape. Rainfed agriculture is less developed in the target landscape due to low precipitation levels, particularly in recent years. However, agriculture remains the main economic activity. During the wet season, rainfed crops are grown on dune fields, with farmers each cultivating around 6 ha of millet, sorghum and black-eyed peas, which are the primary food crops in the region. As yields from rainfed agriculture barely cover one month of the annual needs of a household, local communities resort to irrigated agriculture from October to April. Farmers tend to cultivate less than 1 ha each. Using concrete wells and catch basins or channels, land is irrigated using water directly from the lake. Crops include sweet potatoes, onions, wheat, capsicum, cassava, garlic, zucchinis, tomatoes, apples, cauliflower, lettuce, peanuts, black-eyed peas, eggplants and peppers. Considering the unpredictability of rainfall, irrigated market gardening is the safest and most common form of agriculture. The use of chemical fertilizers is prohibited by the government. According to the Communal Director of Agriculture, an area of about 954 ha is exploited for market gardening. Livestock breeding constitutes the second predominant economic activity after crop agriculture in the target landscape, representing an important source of income for local communities. The basin is home to a wide variety of livestock including cattle, goats, sheep, camels, horses, and donkeys. Before the formation of the lake, it was a migratory herding point and continues to be a preferred destination for migratory herders as well as the indigenous population. Similarly, fishing has become a more common practice through increased support from external parties and the local population. The area now also attracts fishermen from across the Tahoua region and even from abroad. The total population within the target landscape is about 42,000 people, mostly comprised of Tuareg and Hausa. Approximately 3,500 people live directly around the lake. Aside from a small and informal local crafts industry comprising shoemakers, sculptors, leather workers, and tailors, the primary socioeconomic activities in the region are focused around fishing, agriculture, and livestock breeding. However, these activities are becoming less reliable as agricultural productivity falls with erosion and drought. Furthermore, poverty is prevalent throughout the region, with 71 percent of the population classified as “poor” or “very poor.” The main criteria of wealth include the size of the household, the area of cultivated land, as well as ownership of lands, cattle and agricultural equipment. Based on these criteria, the middle class and the wealthy together represent just 29 percent of the population. There are only a few sanitation systems in place, and garbage and human waste is often disposed of in the open air, leading to considerable health risks. Different grassy species constitute the basic fodder resource for livestock breeding, and according to local communities, fodder availability has declined considerably in recent years. Causes include the decrease in rainfall, overgrazing, the expansion of invading species not suited for feeding (such as Sida cordifolia, and Pergularia tomentosa), an increase in land silting, and the reduction of pastoral land in favor of croplands. This competition for land among pastoralists and farmers has already led to cases of nonviolent conflicts, due to livestock invading farmlands, or the encroachment of farmlands on passageways for livestock. Fishing has also become an important source of income for the communities around the lake and is contributing to improved local food security. The fresh fish is sold in the local markets in Tahoua and Agadez. Due to a lack of refrigeration equipment and infrastructure, fresh fish that cannot be sold are smoked, grilled or dried, to be exported to Nigeria. Local fishermen are organized into cooperatives, which are headed by a central coordination committee. There are nine cooperatives, comprising about 230 official members overall: five in Tabalak, two in Kéhéhé, and one each in Fachi and in Tsaouna. However, there are a few dozen clandestine fishermen without fishing permits, according to the president of the coordination committee. Currently, this region is facing threats of accelerated degradation due to pressure from unsustainable agricultural practices and increasing variability in climate, and there is a notable decline in plant and animal biodiversity. The subsistence of local communities in the target landscape heavily depends on the state of the lake and the environment. The decrease in rainfall and more frequent and severe drought has reduced the water level of the lake and caused an even faster drying up at the end of the dry season in May, which is accelerated by evaporation, infiltration, farming and the watering of livestock. Land degradation and deforestation: The loss of vegetative cover—particularly trees—due to overgrazing, clearing of land for agriculture and pastoralism, and fuelwood use has accelerated in recent years. With this loss of vegetation, erosion is becoming more severe, further exacerbating land degradation and plant biodiversity loss. Furthermore, the availability of multipurpose plant species for fodder, firewood and construction material for local communities is decreasing. Expansion of invasive species: The spread of invasive species seems to be increasing. Invasive species compete for minerals and water with local species and reduce crop yields. They often also have sharp thorns that are dangerous to humans and livestock and replace grassy species crucial as fodder for livestock. Reduced precipitation and water volume loss: The decrease in rainfall and more frequent and severe droughts have reduced the water level of the lake and resulted in faster lake depletion at the end of the dry season. Factors such as siltation, invasion of aquatic and thorny plants, and higher temperatures have played a part as well. The result is a loss in water volume in the lake, reducing its overall depth and water quality. This has already impacted fish populations and may impact migratory birds in the near future. Overfishing and decline of fish populations: Local demand for fish, as well as fish exports to Nigeria, have considerably increased since 2000. Combined with the illegal use of large-scale fishing equipment, this has led to the fishing of juvenile fish, reducing revenues and putting fish populations at risk due to interruption of their reproductive cycles. 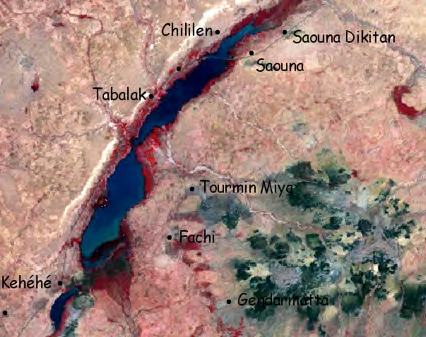 A Baseline Assessment, led by the Faculty of Agronomy of the Abdou Moumouni University of Niamey, was conducted to mobilize local community members, stakeholders, and government representatives in evaluating the condition of the target landscape and collaborating on the development of a Landscape Strategy to enhance the resilience of the area surrounding Lake Tabalak. An initial meeting with local leaders was held in October 2013 in the town of Tabalak, and the community was invited to participate in a mapping exercise to identify key components and vulnerabilities of the socio-ecological landscape. More than 150 stakeholders, including community leaders, members of the rural population, and the mayor then participated in 17 workshops, where participants used the SEPLS indicators to identify key environmental and social concerns of the target landscape. A Landscape Strategy was developed based on the results of the focus group discussions and the indicator scoring exercise. The Baseline Assessment and Community Consultation gave rise to the COMDEKS Landscape Strategy for Niger, which sets out a slate of four Landscape Outcomes and associated indicators to measure progress toward these outcomes (see Table Ni-1). Restoration, protection, and sustainable management of the local environment. · Area of restored lands (plateau, glacis, watershed and dunes). · Area of treated water bodies (weed cutting and treated banks). · Number (%) of people who have adopted sustainable technologies and sustainable ancestral practices. An increase in fish diversity and fish production in Lake Tabalak. · Number of modern methods employed for production and conservation of fish. · Percent of fishermen who have adopted conventional methods of catching fish that avoid catching juvenile fish through larger meshes of nets. Improvement in the welfare of the community through the creation and diversification of sustainable income-generating activities. • Increase in the incomes of vulnerable households (very vulnerable and moderately vulnerable). · Number and type of activities/income-generating enterprises or alternative sources of income introduced and adopted. Strengthening of the local institutional capacity for rational and sustainable landscape management. · Number of organizations (unions, groups, associations, or communes) practicing sustainable landscape management that have been created or made more active. · Number or type of plans, programs, projects or agreements for sustainable landscape management agreed and implemented by the commune. · Number of lessons and good practices generated from local landscape projects. Improvement of resilience and durability of the landscape in the face of the effects of climate change and human pressures. Capacity building of local communities on sustainable fishing practices. Introduction of techniques for sustainable exploitation of wood and non-wood forest products. Facilitation of partnerships and cooperation between communities, local authorities and development actors. Based on this guidance, six local projects were selected as part of COMDEKS Niger’s portfolio of landscape interventions in the Lake Tabalak region, with grants ranging from US$29,000 to US$42,000. Each is led by a different community-based organization (See Table Ni-2). 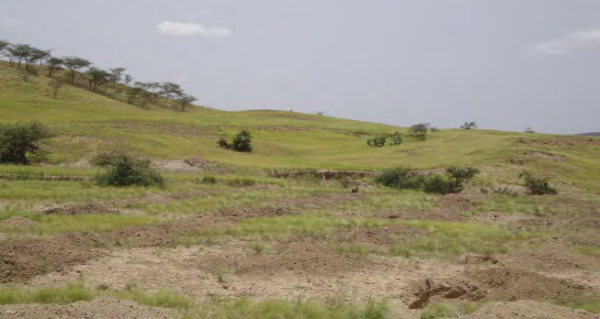 The project consists of technical assistance in construction of demi-lunes (a micro-catchment technique mainly used for increasing pasture production and rehabilitation of degraded lands) as well as ecological rehabilitation of dunes. This includes the implementation of a sustainable natural resource management mechanism. Restoring sand dunes and implementing sustainable management practices for their resources will be vital to meeting the needs of local communities in the longer term. The project’s strategic approach includes the mobilization, participation and effective empowerment of rural communities in the implementation of operations. The project’s goal is to protect the lake to help reduce siltation and eradicate the invasive plant species Typha australis and Ipomoea erecta. The project’s main activities are planting trees, removal of invasive plants, facilitation of village meetings, production of a documentary film and the production and distribution of other media. US$29,063 Outcomes 1, 4 The project consists of dune restoration and environmental education that can improve living conditions for populations affected by the impacts of climate change. By reforesting 70 ha of treated sand dunes, the lake will be more protected from siltation. Outcomes 1 ,2, 3 The strategic approach of this project involves the mobilization, participation and effective empowerment of fishing communities in the project implementation. The lake will be repopulated with species such as Lates niloticus and Bagrus bajad to rehabilitate biodiversity and generate income for fishermen and fishmongers. US$39,547 Outcomes 1, 3 The project aims to protect the lake against siltation through the restoration of 75 ha of degraded land by building anti-erosion benches, planting trees and cutting weeds of invasive plants such as Typha australis and Ipomoea erecta. The recovery of these lands will also enhance fodder availability and contribute to restoration of vegetation. US$41,963 Outcomes 1, 4 This project involves the rehabilitation of grazing land through construction of demi-lunes, with the active participation of local actors through capacity building. Local supervisors for initiatives and plotters will be trained and 15,000 seedlings for various species of herbaceous plants will be planted to rehabilitate degraded land and create more environmental awareness among the local population. Stabilizing shifting sand dunes and removing invasive species: COMDEKS-funded initiatives in the target landscape have successfully supported the rehabilitation of local plant species to stabilize the shifting of sand dunes. In particular, the planting of Euphorbia balsamifera seedlings has reduced the movement of sand dunes impacting the lake. Project activities have enabled the resumption of gardening activities through the clearance of invasive species, thereby increasing the land area for cultivation, and reducing water consumption by the invasive species as well as siltation of the lake. More than 150 ha of farmland and 100 ha of sand dunes have already been rehabilitated through project activities. As a result, local communities have been able to increase their incomes by growing and selling tomatoes and onions. Increasing the availability of pastureland: Training in dune stabilization techniques, including selective removal of certain invasive species that compromise sand dune stability, as well as planting of the native Leptadania pyrotechnica as a sand dune binding material, have substantially reduced erosion and increased the availability of pastures for livestock. Empowering women and vulnerable groups: The high participation of vulnerable groups such as women and youth has contributed to increasing food security and improving livelihoods. Women in particular are actively involved in a project to design cooking equipment and the establishment of a revolving fund to finance alternative income-generating activities. So far, the revolving fund has accumulated working capital of 300,000 FCFA (US$525), which women fishmongers have used to purchase fish frying equipment and accessories for their local businesses. Adopting sustainable fishing practices and restoring local fish stocks: Locally appropriate training and equipment have allowed 50 fishermen to adopt more sustainable fishing practices that reduce the harvesting of juvenile fish, thereby allowing fish populations to recover without interrupting their reproductive cycles. More than 35 percent of fishermen active at Lake Tabalak have now adopted sustainable fishing practices, and have been informed about national fishing regulations they must abide by. Furthermore, the stocking of the four fish species Clarias sp, Lates niloticus, Bagrus bajad, and Auchenoglanus sp, which had disappeared from Lake Tabalak years ago, has rehabilitated fish populations and improved incomes of fishing communities and fishmongers (particularly women) through increased marketing of fish products. Since restocking of the lake, fish catches have increased from 10-15 tons to 42 tons per year, with individual fish sizes of up to 10 kg. Continuation of sustainable fishery management practices will sustain incomes in the long-term without depleting fish resources. To make sure this comes about, a committee was set up within the fishing cooperative to ensure compliance with sustainable fishing methods and to penalize offenders. In addition, local manufacture of fishing equipment such as nets, longlines, and fish traps during the dry season, when fishing is not possible, has reduced the debts of fishermen who might otherwise acquire high-priced equipment from rogue traders. COMDEKS projects have definitely broadened local environmental awareness and shifted how people view their landscape and its potential for restoration and increased productivity. This is true particularly among the area’s fishers. Creating awareness of the causes for diminishing fish resources, increasing the understanding of sustaining ecosystem health to ensure future incomes, and training in locally appropriate fishing techniques and sustainable natural resource management has caused fishermen to rethink their practices and adopt more sustainable techniques. By involving fisherman in the decision-making and management of lake resources, the COMDEKS projects have helped to implement more sustainable fishing periods in Lake Tabalak, with the fishing season now starting later and ending earlier in the year, allowing uninterrupted reproduction cycles of fish populations in order to sustain livelihoods in the long-term. The fact that a local monitoring mechanism has been established to ensure compliance with sound fishing practices and fishing seasons is testament to this new commitment to sustainability. In addition to this increased environmental awareness has come a substantial strengthening of the organizational, technical, and financial capacities of local CBOs, as well as their ability to work together. Again, this is strongly evident in the fishers cooperative, which has been greatly strengthened as COMDEKS has proceeded. Local CBOs who once worked in isolation are now able to communicate and cooperate, based on their COMDEKS experience. The government is supporting this CBO emergence through the establishment of a National Directorate of Support for Cooperative Action (DACPOR) to provide CBOs with technical and mentoring support. In addition, CBOs are represented in all major meetings at the national and regional levels—a testament to their increasing profile. Another indication of increasing landscape governance capacity is the formation in some villages of local management committees concerned with local natural resources. The active participation of local and regional government in COMDEKS projects was an important key to success. Involving departmental and municipal authorities, such as the prefect or mayor, as well as technical services, including the departmental directorate or communal environmental service, significantly contributed to project effectiveness. Ensuring accountability of the management committee for the restoration of agroforestry and pastoral areas has been another key to project success. Furthermore, the high level of women’s participation (nearly 70 percent of the dune restoration and nursery work was done by women) contributed to this success, since they were heavily involved in raising seedlings and ensuring sustained growth of plants. The training of community members on simple techniques of environmental protection, such as selective weed cutting and increasing Leptadania pyrotechnica cover to stabilize the sand dunes mechanically, has helped to increase community awareness of the importance of environmental protection measures to sustain their livelihoods. For increased project efficiency and sustained impacts, project activities should be extended to a radius of at least 10 km around the lake, particularly with regard to water and soil conservation, as the environmental health of the surrounding area will be crucial to sustaining project results in the target landscape. Additionally, future project activities should address the issue of gullies, called koris, which are a major problem in the region. Koris flow episodically during rain events, contributing enormously to the silting of the lake and causing serious damage to croplands, woody vegetation and homes.